The garlic scapes are up, and we have started picking! They are so good this year, we just want to sing about them! 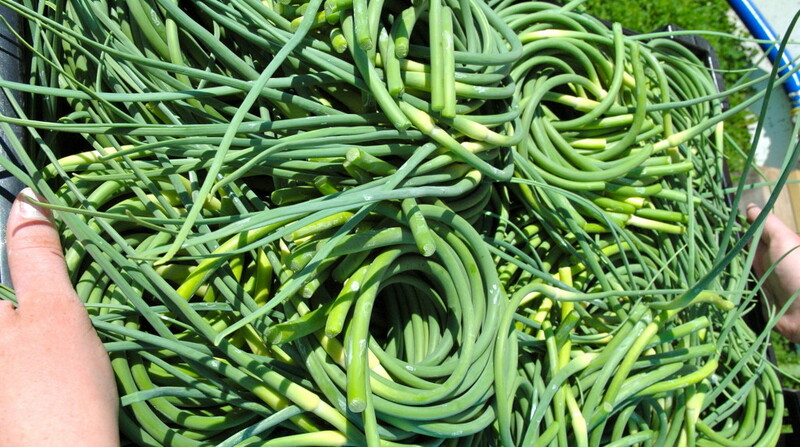 Garlic scapes are the stalks that grow from the bulbs of hardneck garlic plants. Once the scapes are long enough to make a cute loop like a pig’s tail, they get picked. We pick them in order to help send more of the plant’s energy into growing a big bulb. Farmers used to throw them into the compost, but now they have become a culinary treat. Certainly Garlic Scapes look amazing in a fresh bouquet of flowers. Their long curlicue tendrils can make even dandelions look like art. But put them on your plate and they’ll blow your mind. And they contain only 30 calories per 100 grams! Blend all ingredients in a food processor, pulsing between the addition of each new ingredient. Check the potency of your scapes and adjust to your taste. – Blend them into salad dressings – Green Goddess just got a little more divine! As you can see, the garlic scape is a versatile ingredient! One of our favorite ways to cook scapes is also the simplest: Toss them with a bit of olive oil and then cook on the on the grill. It is a beautiful way to serve them (and a delicious way to eat them). They get caramelized and sweet! Buy them on our website and we will ship them to you anywhere in the country. We also sell them at our farm stand, which is self-serve and open 24/7. Bon Apetit! This entry was posted in Garlic and Health, garlic scapes, Gourmet Food with Garlic, Local Food, Vermont. Bookmark the permalink.